When you want to find out if something is safe to use, what do you do? How do you know that the aeroplane you fly on is safe to fly? Take it to bits perhaps, but that isn’t always possible and certainly not always desirable. What happens if you don’t want to damage it at all? You need a non-destructive testing (NDT) expert and the chances are that when you find that NDT expert, they will have been trained by Penistone-based Lavender International. We spoke to Business Development Manager, Amy Schofield, at Lavender International about the training they provide to UTC Sheffield students. Predominantly we train people in how to do non-destructive testing. We run our own training and examination centres and we also provide consultancy services. These services range from auditing companies on how they do their non-destructive testing to research and development, providing expert witness testimonies, providing independent technical reports and failure analysis services. We also work with colleges to support the delivery of the new apprenticeships in non-destructive testing. We have offices in Houston, Texas in the USA, as well as in the UK, and we support programmes all over the world in countries like Greece, South Africa, and Canada. It comes down to reputation – we have built a really good reputation all over the world as a result of the fundamental core values Lavender was founded on: Quality, Flexibility and Trust. We have a way of operating that’s friendly and down to earth as well as expert, which is often referred to by people as ‘the Lavender way’. Lavender is employee owned, what does that mean? Lavender International had been a family business for 40 years, but a succession plan needed to be put in place following the retirement of the Lavenders and employee ownership seemed the perfect fit. Employee-owned status means that all Lavender employees are equal co-owners with a stake in the business, which means that we are all really invested in making the business a success. Why does Lavender work with the UTC? It’s always been a principle of Lavender to pass on knowledge to the next generation. Like the rest of the engineering industry, we have an ageing workforce and we need young talent. 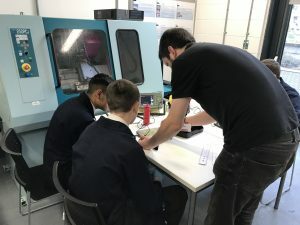 We want to encourage young people to consider a career in non-destructive testing, as our industry has so much to offer, such as the opportunity to travel all over the world! What sort of activities do you do with UTC students? We visit the UTC to demonstrate non-destructive testing to the students. Last October, for example, we came in and did two days of demonstrations for the Year 10 and then Year 11 students. 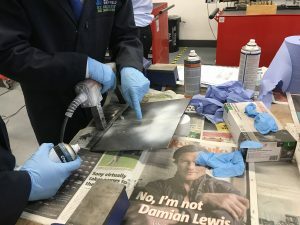 We showed them three different methods – Penetrant Testing, Magnetic Testing and Ultrasonic Testing – and then let them have a go themselves. The students seemed to really enjoy having hands-on experience and doing something a bit different to their usual curriculum. The sessions are often used as part of an assignment or project the students are working on. We like to run the sessions a few times a year and we will be doing another one soon. We have also had a UTC student on work experience at our Penistone office, which was great. We attend careers events hosted by UTC, where we have a stand and talk to parents and students about jobs in our industry. There are companies there from right across the engineering sector, as well as university and college stands, which is a great opportunity for the students. We are also keen to donate any equipment that we no longer need, for example, we have recently donated three harness testing machines to UTC. I think the UTC is brilliant – there is so much technology for the students and the teachers are fantastic. They run all kinds of projects with the students, and the students get to be involved in all sorts of cool things like building go carts for the Green Power challenge or entering the WorldSkills competitions. What really strikes me is that the students are so enthusiastic – it’s clear they want to be there and to learn. The students on engineering courses at the UTC really want to go into engineering and they’re motivated. That’s what our industry needs.